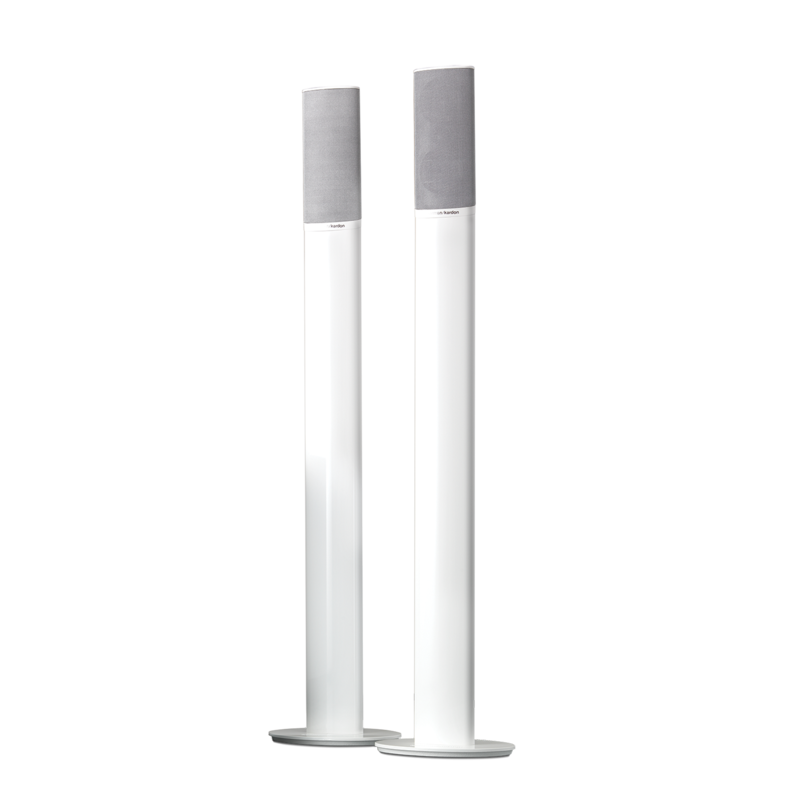 Designed to position the HKTS 9, HKTS 16 and HKS 4 satellite speakers at an ideal height for seated listeners, these aluminum floor stands feature a cable-management system to keep speaker wires out of sight. HTFS 2 is rated 4.6 out of 5 by 9. Rated 5 out of 5 by Mossman from As advertised Ordered a pair of the HTFS2 speaker stands for my HK16 speaker system a while back. When they came on sale again recently I snapped up another pair for the rear speakers. Quality always good, as advertised and the customer service, excellent! Rated 5 out of 5 by StarLove from Great quality. I love these stands. They are beautiful, shiny, and sturdy. It definitely help with the surround sound experience. The speakers by Harman Kardon that we have placed on them seamlessly. I do recommend these stands if you have Harman Kardon speakers. I love Harman Kardon. I have it in my Mercedes as well. the best sound system ever. Rated 5 out of 5 by Nieko06 from Beautiful stands I was disappointed when I bought my speakers and I couldn't find these stands anywhere. I am so glad they started selling them again. These stands are a perfect match to my HKTS 16 speakers. I highly recommend these stands. Rated 5 out of 5 by PilotGuy from Looks seemless Bought these last week they came incredibly fast with the two day shipping. Setting up took less then 20 minutes all together and they fit absolutely seemless with the speakers. Is this stand compatible with HKTS 5? HTFS 2 will match these speakers sets: HKTS 9, HKTS 16 and HKS 4 satellite speakers. Hi, Are these stands compatible with the SAT-TS8? Hi, Yes, the HTFS2 floorstands are compatible with the TS8 Satellite speakers. Will these work for HKTS 15 speakers? The HTFS2 will work with HKTS11/14/15/16/18. Therefore it will work with the HKTS 15. The HTFS 2B is the same as the HTFS2. the &quot;B&quot; refers to the color Black. Can you connect to an amprifier other than harman Kardon? The HTFS 2 was designed to match the HKTS 9, HKTS 16 and HKTS 4 speaker systems. Any compatibility with other brands and devices is untested. Hi. You will need the HTFS 2 speaker stands for your HKTS 16 system. 1. Will this stand work the HKTS 18 speakers?&nbsp; 2. How does the speaker attach to the stand? The HTFS 2 is compatible with the HKTS 18 system. To hook it up, it would a simple setup through a few screws and a bracket. Will it work with the HKTS 30 speakers? No, the HTFS 2 stands will not fit your HKTS 30 speaker system. HTFS 3 will match these speakers set: HKTS 20, HKTS 30, HKTS 60, HKTS 65 and HKTS 200. HTFS 2 will match these speakers set: HKTS 9, HKTS 16 and HKS 4 satellite speakers.